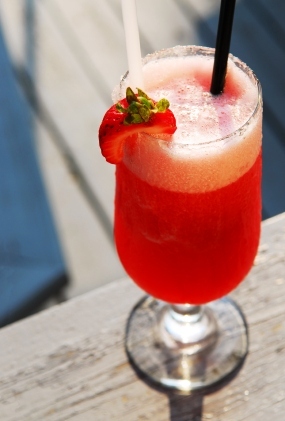 I've got the best strawberry daiquiri recipe for you. There is no end to recipes available for fresh strawberries. When fresh is not available, use frozen. First if you don't have superfine sugar, we are going to make some. In a blender, place the sugar in it and process for 20 seconds. There you have it, superfine sugar. Now in the same blender, add the ice, (the sugar is already in there) and strawberries. Then add the remaining ingredients and process until smooth. Wet the rim of your glass with the lime that you juiced and dunk the rim into sugar. Then pour the daiquiri in the glass and garnish with strawberry slices. For a Virgin Strawberry Daiquiri, just leave the rum out. It's so delicious and refreshing. Okay, you are relaxing with a tasty cocktail on a beautiful day. Why not grill dinner while you are outside? I stuff these burgers with cranberries, and top with stuffing and gravy during the winter. I also melt cheese (use your favorite) on top of these beauties. Top with lettuce and tomato in the summer. Grilled pineapple slices with fresh mango salsa are wonderful too. Delicious. This recipe makes 4 chicken burgers. To make the cranberry stuffing, bring the orange juice to a boil in a small pan; remove from heat. Add the cranberries and let stand for 5 minutes. Drain and set cranberries aside. Mix the ground raw chicken with the bread crumbs, and add the seasonings. 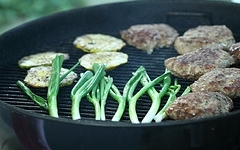 Mix well and shape into eight (1/2" thick) burgers. Place 1/4 of the cranberries and 1/4 of the parmesan cheese in the middle of the burger and top with another burger; sealing edges together with fingers. Repeat until you have 4 burgers. Place on greased grill rack, cover and grill for 14 to 18 minutes. It's cooked when no longer pink in the middle and reached 165 degrees. Top with a slice of cheese. Butter the buns and place on the grill to toast. Lower lid and grill until toasted and the cheese is melted on the burgers.